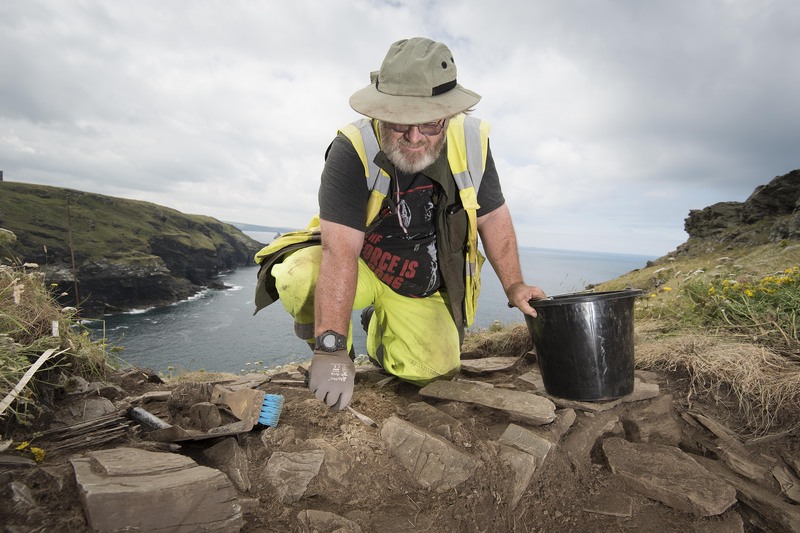 Archaeologists excavating the site of Tintagel Castle in Cornwall, legendary birthplace of King Arthur, have unearthed the remains of massive walls built in the 6th century. 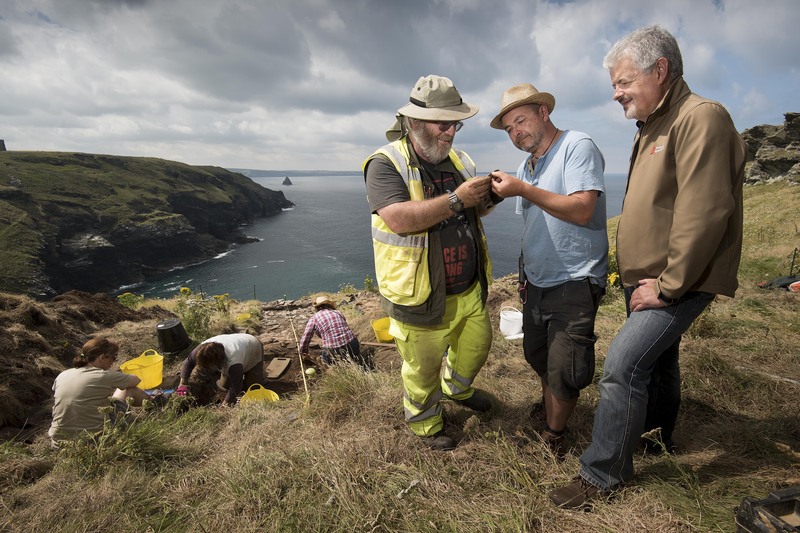 The excavation is the first in a new five year archaeological exploration commissioned by English Heritage, the first major research project at Tintagel in 20 years. 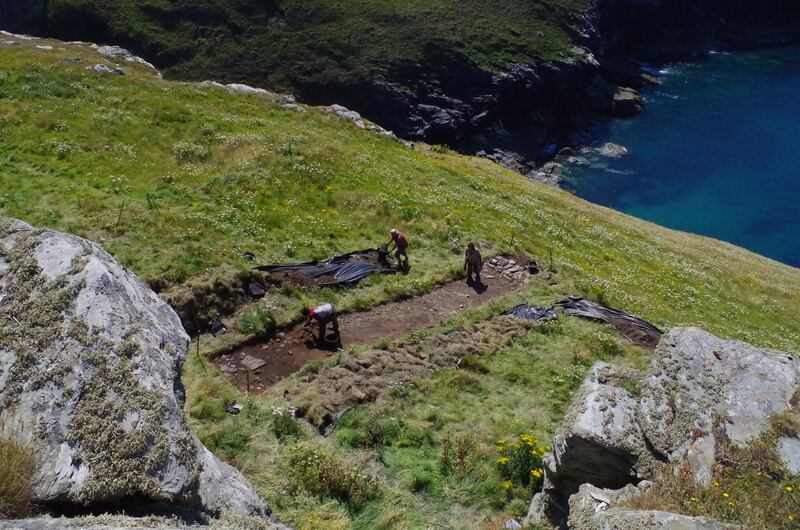 A team from the Cornwall Archaeological Unit did geophysical surveys of unexcavated terrace areas on the vertiginous headland where structures from the earliest iteration of the castle (5th-6th century) were believed to have existed. The survey confirmed there were walls and other elements of varied size from post-Roman structures underground. 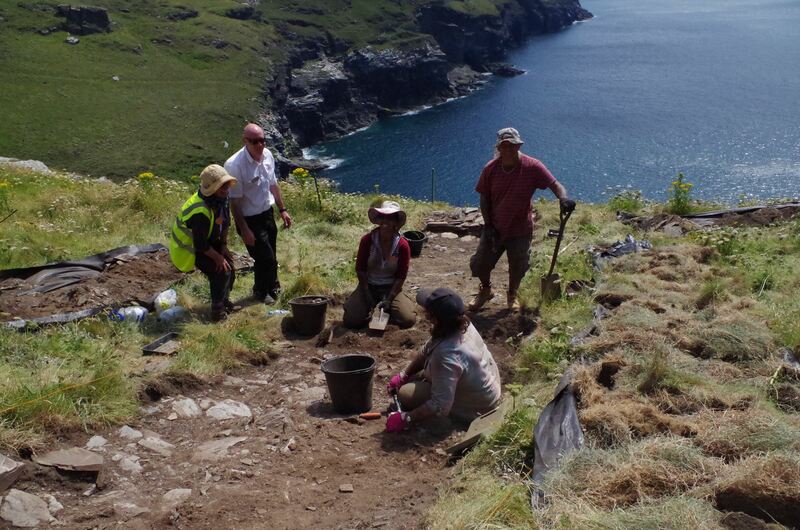 Excavations began on July 18th and continued through August 2nd. Four trenches were dug on the terraces and as the geophysical survey indicated, the remains of ancient walls three feet thick emerged. The formed two rooms about 11 meters (36 feet) and four meters (13 feet) wide. This was a massive, imposing structure, at the very least a high-status building, and possibly even a royal palace complex. No similar structures from ancient Cornwall, then known as Dumnonia, have ever been found, so if these large walls can be confirmed as royal, it suggests this may have been a central, static court, as opposed to a mobile one that moved from stronghold to stronghold without a Camelot-like headquarters. 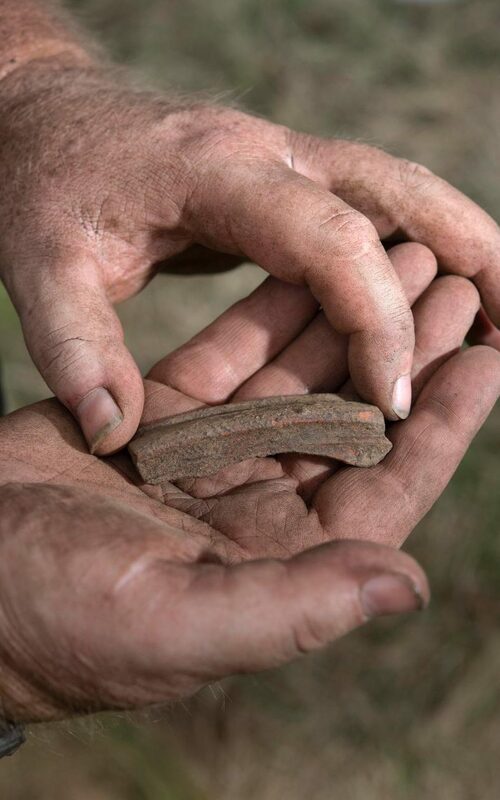 Other finds include more than 150 fragments of pottery and glass, including pieces of imported late-Roman amphorae, glass, probably imported from Merovingian France, and a rim from a bowl or serving dish made of expensive Phocaean red-slip ware made in western Turkey. They date from the 5th or 6th centuries. Tintagel was a bustling settlement in the centuries after the Roman retreat from Britain. Surveys have found evidence of almost 100 buildings, plus gardens and pathways, on the headland alone. Thousands of pottery fragments, most of them imported from the Mediterranean in the 5th to 7th centuries, attest to Tintagel’s importance as a trade center and as the home of regional rulers during the post-Roman period. Many luxury items have been identified at the side: wine from Turkey, olive oil from the Aegean, glassware made in Merovingian France, dishware from North Africa. The settlement was abandoned in the late 6th or early 7th century, possibly due to a catastrophic occurrence like plague. Tintagel lived in memory, however, as the home of Cornwall’s early kings, which is probably what inspired its literary connection to King Arthur. The 12th century chronicler Geoffrey of Monmouth wrote in his History of the Kings of Britain that Gorlois, Duke of Cornwall, tried to keep his beautiful wife Igerna from the lustful depredations of Uther Pendagron by hiding her at Tintagel. Uther’s advisor Ulfin noted that only magic could get Uther past its impregnable defenses. As the story goes, Merlin magically disguised Uther to look like Gorlois, he and the lady Igerna made sweet, fraudulent love and nine months later, with Gorlois safely dead and Uther and Igerna now married, Arthur was born. 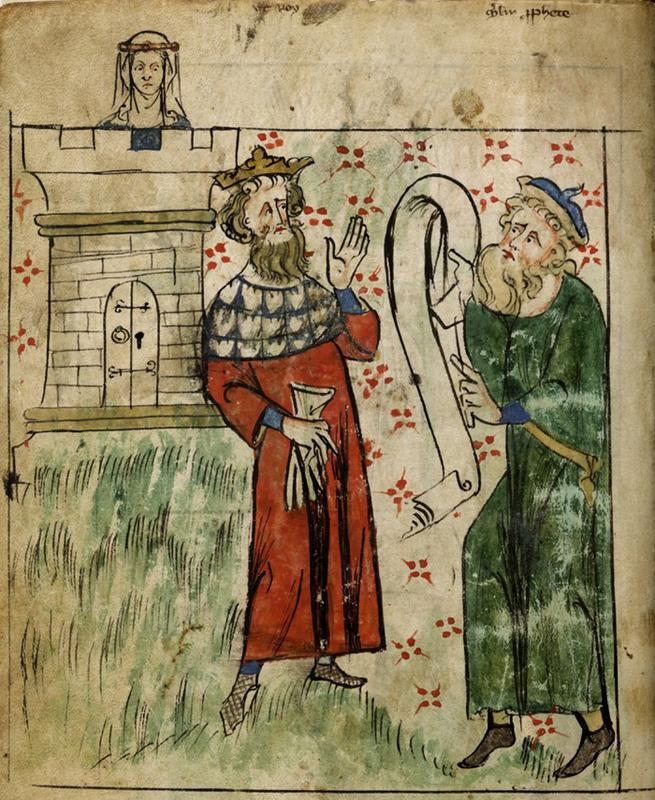 Geoffrey made no distinction between history and legend, and his version of the Arthur story was embellished even more than it already was in his sources. There was already a tradition in Cornish and Breton folklore at the time Geoffrey was writing that associated Tintagel with the famous love story of Tristan and Iseult. That was later woven into Arthurian legend, with Tristan becoming one of the Knights of the Round Table, but in the late 12th-century it was its own tale. Tintagel was the fortress of King Mark of Cornwall, Tristan’s uncle and Iseult’s husband. The Arthur legend as recorded by Geoffrey of Monmouth and the Cornish legends of Tristan are the reason the ruins of the Tintagel Castle that still stand today exist. Richard, Earl of Cornwall, the brother of King Henry III, was as erudite as he was rich. He traded three manor houses for the site, which had no defensive value whatsoever, and the only castle that could be built on that rocky outcropping was rather small and inelegant for a man of Richard’s refined tastes and financial wherewithal. It was purely its association with the great ancient kings of yore that inspired Richard to build a castle there. By the 14th century it was already in decay. Using the information and materials discovered in this year’s dig, the team will make plans for more extensive excavations next year. They’ll have a clearer picture of the footprint of the medieval structures and they’ll be able to analyze samples that may fill in more blanks about how buildings were built, when and for what purposes. This entry was posted on Friday, August 5th, 2016 at 8:31 AM	and is filed under Ancient, Medieval. You can follow any responses to this entry through the RSS 2.0 feed. You can skip to the end and leave a response. Pinging is currently not allowed. All very well, but Arthur was a Kelso lad, everyone knows that. Cornwall, my left foot! To have a more or less ‘central’ stronghold AND a mobile court does not REALLY exclude each other. The DE-centralized ‘strongholds’ often were not THAT ‘strong’, and to move the court was often an -almost unbearable- bare necessity, i.e. in order to keep up ones own early medieval grip on power. Of course, ‘Merovingian Francia’ is not to be confused with ‘France’ as its later spin-off. we dance whenever we are able. Vertiginous indeed! What what a lovely place to work, so long as the weather’s gentle. There are times I think the Arthur hunters in Britain are as strange as our American runestone addicts. Perhaps we should put them all in small boats and send them out to look for Avalon or Hy-Brasil at the height of hurricane season? The initial report I saw on this story said it validated Geoffery of Monmouth as he couldn’t have known of the original Tintagel castle as it “no longer existed in his time”? I saw pictures of the ruin sticking up on the cliff face in the 1960’s. I’ve got to think more of it was there in the 12th century? Geoff may have been prone to telling whoppers to please his patrons, but he would have known of that ruin and legends around it. Good luck to them, but I think they’re on a another wild Arthur chase. Many luxury items have been identified at the SITE – needs fixing. Regarding an outbreak of plague as the possible cause of Tintagel’s abandonment, I recommend David Keys’ Catastrophe: An Investigation into the Origins of Modern Civilization (2000). Plague emerged from Africa in the mid-sixth century, made its way to the Middle East, the Mediterranean, and then to Europe’s ports. Very bad times, profound and widespread consequences.